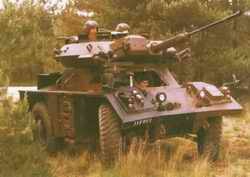 In the 1960s, the Fighting Vehicles Research and Development Establishment (now part of the Defence Evaluation and Research Agency) designed two reconnaissance vehicles, the Combat Vehicle Reconnaissance (Tracked) Scorpion (FV101) and the Combat Vehicle Reconnaissance (Wheeled) Fox (FV721), both of which use the same Jaguar 4.2 litre petrol engine. 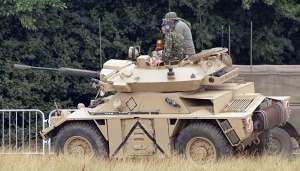 Development of the Fox began in 1965 and the following year the Daimler company of Coventry, which was building the Ferret scout car at the time, was awarded a contract to build 15 prototype vehicles. The first was completed in November 1967 and the last in April 1969. User trials began in 1968 and the first official announcement concerning the Fox was made in October 1969. 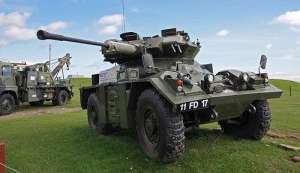 The following year the Fox was accepted for service with the British Army and a production order was placed with Royal Ordnance Leeds. Production began in 1972 and the first vehicle was completed in May 1973. Production of the Fox has been completed at Royal Ordnance Leeds, which was purchased by Vickers Defence Systems in 1986. 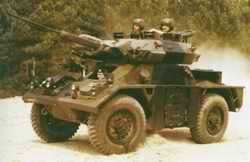 Daimler completed production of the Ferret in 1971 and then closed down its armoured vehicle production facility. Sabre. 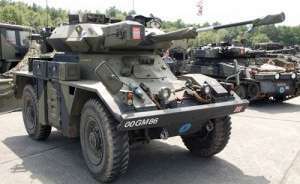 Details of this vehicle are given in the entry for the Alvis Scorpion reconnaissance vehicle in the Armoured fighting vehicles families section. 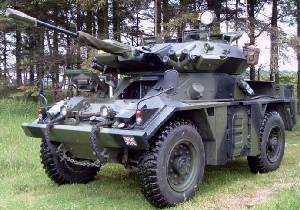 All of the welded aluminium turrets for the Fox light armoured car were manufactured by Alvis Vehicles. A small number of Fox turrets were fitted on FV432 full tracked armoured personnel carriers. 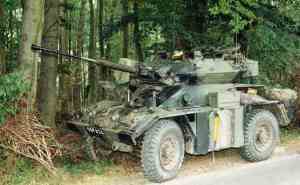 These were deployed with the Berlin Brigade but some are now used for training purposes in the UK. 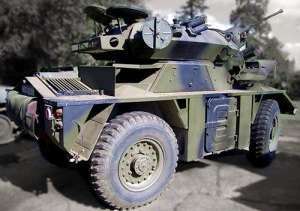 The Fox is a further development of the late production Ferret light scout car (covered in detail in a separate entry) and has an all-welded aluminium armour hull and turret which gives protection against medium and heavy machine gunfire and field artillery splinters. The driver is seated at the front of the vehicle and is provided with a hatch cover that lifts and opens to the right with an integral wide-angle periscope that can be quickly replaced by a passive night periscope. The turret is in the centre of the vehicle with the commander/loader on the left and the gunner on the right, both with a single-piece hatch cover that opens to the rear. The commander has a periscopic binocular surveillance instrument in a rotating mount with a magnification of x 1 and x 10 and seven observation periscopes. The gunner has a periscopic binocular daylight sight linked to the main armament, with a magnification of x 1 and x 10, and two observation periscopes. Mounted to the right of the main armament is a GEC-Marconi Defence Systems SPAV L2A1 passive night sight with a high-magnification of x 5.8 (8° field of view) and a low magnification of x 1.6 (28° field of view), the first for gunnery and the second for surveillance. There can be no confusion between the two because when the high magnification is being used a shutter isolates the low magnification, and when the other is being used an iris diaphragm isolates the high-magnification objective. The image intensifier tube is protected from the effect of gun muzzle flash by a flash shutter which is operated electrically from the gun firing circuit. When high magnification is selected an illuminated ballistic graticule with brightness control is automatically injected into the optical system. The exposed objective window is cleared by a wiper and washer and the sight is protected by an armoured cowl with a door which is kept closed when the sight is not in use. The L2A1 night sight will also detect infrared devices. The radios are in the rear of the turret and the batteries are stowed below the false floor in the crew compartment. The engine compartment is at the rear of the hull and the engine and its auxiliaries, including the main and transfer gearboxes, are mounted as a power pack which can be removed through the rear of the hull. The engine is a militarised 4.2 litre Jaguar XK with a reduced compression ratio (7.75:1) in order to use military petrol. The valve gear is leadproofed and a single two-choke Marcus carburettor is fitted, as is a Ki-gas cold starting system. The cooling system has twin radiators horizontally disposed across the top and to the rear of the engine and, sealed to the radiator, a pair of ducted centrifugal fans. An oil/water heat exchanger unit serves both the engine and the transmission. Power is transmitted from the engine to the wheels through a fluid coupling, a five-speed preselecting epicyclic gearbox, and a transfer box providing reversal of all five speeds. The independent suspension comprises in each case an upper and lower wishbone, a coil spring and a hydraulic telescopic damper. The upper and lower wishbone linkages incorporate lubrication reservoirs and the dampers are enclosed in the recoil springs. The independent suspension allows wheel movements of 0.279 m and the tyres are of the run-flat type. The Fox can ford to a depth of 1 m without preparation. A flotation screen carried collapsed around the top of the hull can be erected by the crew in 2 minutes and the vehicle is then propelled and steered across the river or stream by its wheels. The front of the flotation screen contains transparent panels for viewing and a bilge pump with a capacity of 205 litres/min is fitted as standard on all vehicles. The Fox can travel down or up river banks with a gradient of up to 46 per cent. Fox has been designed to operate in temperatures from -40 to +50°C and is air-transportable. A Lockheed Martin C-130 can carry three Fox vehicles or two for parachute dropping. 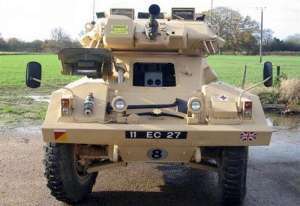 Standard equipment on British Army vehicles included infrared filters for the white light headlamps, a spotlight for the commander, external stowage boxes either side of the hull between the wheels, a drinking water tank containing 13.6 litres and a hull electric distribution box with a cooking vessel socket. inspection socket, intervehicle starting socket and a master switch. Optional equipment includes navigation aids, powered traverse, nuclear and chemical detection equipment and a ZB 298 surveillance radar mounted on the left side of the turret. Main armament of the Fox is a Royal Ordnance 30 mm L21 RARDEN cannon which fires an APDS-T round jointly developed by Royal Ordnance and PATEC of the USA. In addition to the APDS-T round the RARDEN cannon fires standard British APSE-T, HEI-T and PRAC-T rounds as well as standard Oerlikon Contraves HE, AP and Practice rounds. The gun is fired in rapid single shots but bursts of up to six rounds can be fired. The empty cartridge cases are automatically ejected outside the turret. A 7.62 mm L37A2 machine gun is mounted coaxially to the left of the main armament and four 66 mm smoke grenade dischargers are mounted either side of the front of the turret. The main armame/it, coaxial machine gun and smoke grenade dischargers are electrically operated with the main armament and coaxial machine gun having manual overriding control.